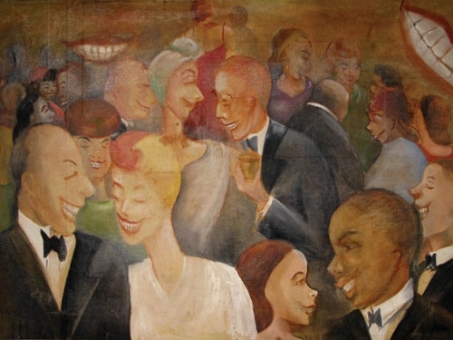 The Cocktail Party (ca. 1944) was painted by artist Dolly Allen Mason directly onto Anne & Edward Spencer’s bedroom wall in their home, which is now the Anne Spencer House & Garden Museum. The painting is still on view today in the Museum and your purchase will help to preserve this unique work of art, as well as the many other treasures in the Anne Spencer Museum. Prints are gicleé on canvas, 26” x 20” (stretched, unframed). Includes a Certificate of Authenticity. Limited Edition Numbered Prints, 1-250. Prints by award winning photographer Susan Saandholland. Sacred Spaces:The Home of Anne Spencer is a 40 page color photographic documentation of the present interior spaces of the Anne Spencer home in Lynchburg, VA. done by John M. Hall. Introduction by poet Jeffery Beam, the photographs are accompanied by captions provided by Anne’s granddaughter Shaun Spencer-Hester and Jeffery Beam in collaboration with Dr. J. Lee Greene, the biographer of Anne Spencer. 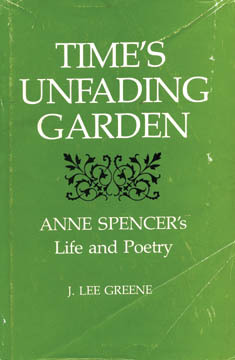 The book accompanied an exhibit of Anne Spencer held at UNC-Chapel Hill February 2015 and are on exhibit through May 2015. Paperback, $35.00 plus tax and shipping. a beautiful and practical guide to restoring an historic garden, as told through photos, notes, and friendships. Using the charming garden of Harlem Renaissance poet Anne Spencer as a case study, Jane Baber White has documented the steps taken by her garden club over a 28-year period to restore and maintain this historic National Register property. The beautiful results have received international recognition. 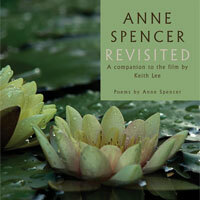 The book includes poetry and writings of Anne Spencer never-before published. "This small-publisher gem is a visual and intellectual feast. It tells the story of Harlem Renaissance poet Anne Spencer's dream of a garden sanctuary come true. It tells through the lens of the garden's restoration. The storyteller is Jane White. who discovered the garden after Spencer's death and heard Anne Spencer's poetry echoing from the earth. Despite the overgrowth and disrepair, White knew the heart of Spencer's 70 year labor of love still beat solidly. The book overflows with stunning photography, some of it vintage, most of it modern day, documenting both Spencer's creation and the community based restoration and preservation effort which restored the glory. This will be a very special gift for gardeners, poets, historians, preservationists and, of course artist!" 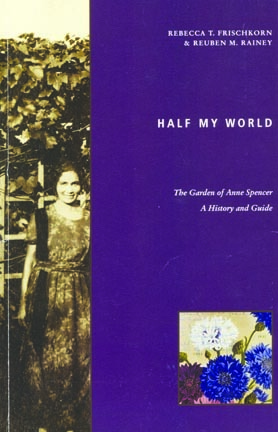 This 86-page paperback book includes a 26 page commentary on Anne Spencer's life and writings and 42 poems by Anne Spencer, illustrated with black and white photographs. Nina V. Salmon is an Anne Spencer specialist and Assistant Professor of English at Lynchburg College. Garden Story film debut on PBS ! (Lynchburg, VA: Warwick House, 2003). 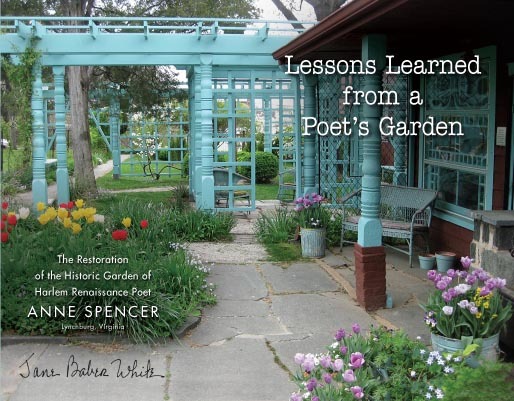 This 160-page paperback book describes the history and restoration of the garden at the Anne Spencer House in Lynchburg, Virginia The book includes eighteen garden-related poems by Anne Spencer; it is illustrated with numerous black and white and color photographs. Rebecca T. Frischkorn is a landscape designer and executive producer and host of Garden Story- Inspiring Spaces, Healing Places, a public television series about how gardens have the power to change our lives. Reuben M. Rainey has taught history of landscape architecture at the University of Virginia for many years; he has published on a range of topics such as Italian Renaissance gardens, 20th century American landscape architecture, and historic preservation. Coffee Table book! Great gift for Garden Day. This 48-page hardbound book includes 20 poems by Anne Spencer, illustrated with Susan Saandholland's lovely color photographs of the Anne Spencer House and Garden Museum. 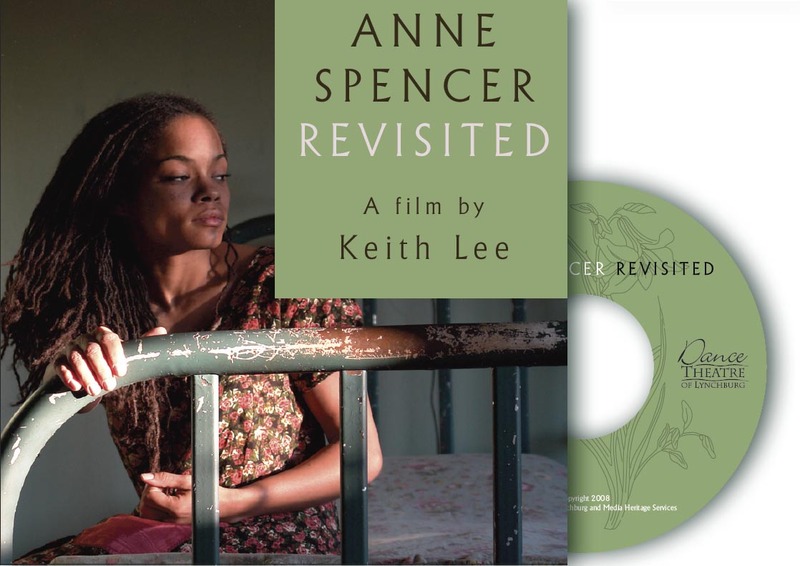 The book includes notes on Anne Spencer's life, her house and garden, the composition of the poems, and the making of Keith Lee's film. Susan Saandholland is a freelance photographer with a studio at Riverviews Artspace in Lynchburg. Beth Packert is a retired lawyer and poetry specialist who teaches English courses at Lynchburg College. 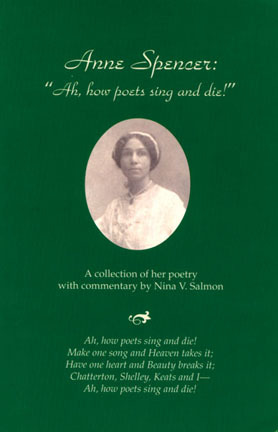 This 23-minute DVD presents a short introduction by Keith Lee and twelve vignettes depicting dramatized readings of poems by Anne Spencer, who is portrayed by Sonia Langhorne. The film was shot by Phil Spinner in the Anne Spencer House and Garden Museum and includes still photographs by Susan Saandholland. Keith Lee is Artistic Director of Dance Theatre of Lynchburg. Collectible! New copies coming soon! This book, published in 1977 by Louisiana State University Press, is now out of print. It is available in some public libraries, occasionally on line, or at an estate sale. "It is the shoulders on which the other books exist and has enriched lives for it." Shaun Spencer-Hester.